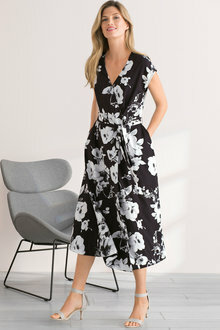 A wrap dress is one of the most stylish ensembles to put together with minimal effort. 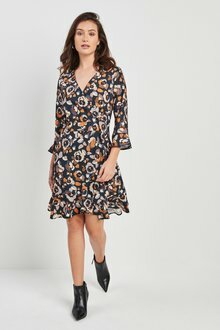 EziBuy has a range of wrap around dresses in all manner of fabrics and prints to suit any taste or figure. 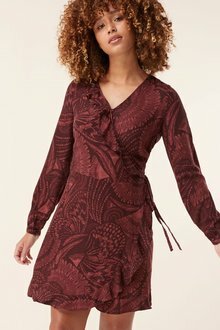 Perfect for a casual family get together or a more formal dinner date, browse our range of wrap dresses today. A wrap around dress fits elegantly around your body, providing a flattering silhouette. Perfect on its own, you can also pair it with a range of accessories to dress it up or down. This summer favourite looks brilliant with a pair of heels or wedges. Or for those chillier nights, match it with some stylish ankle boots. Accentuate the formal look with a chunky necklace or bracelet and, of course, finish off the effect with a feminine clutch. 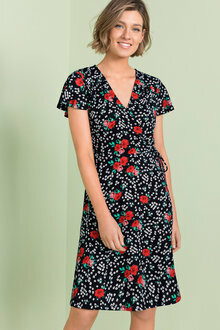 EziBuy stocks a range of wrap dresses, with everything from strappy cotton dresses to 3/4 length sleeve knit dresses. Browse the full range of dresses today to find your next chic addition to your wardrobe.